Built in 1970 by the French aniseed drink tycoon, Paul Ricard, the circuit which bears his name has hosted 14 F1 Grands Prix, 22 Bols d'Or and 12 World Championship Moto Grands Prix. Totally renovated by Philippe Gurdjian at the start of the 2000s, the circuit has become a benchmark for motor sport safety notably because of the asphalt run-off areas used instead of gravel traps. In 2015 the Circuit Paul Ricard also welcomed the return of the famous Bol d’Or. Formerly reserved for teams’ and manufacturers' development testing, the circuit re-opened its doors to the general public in 2009 at the instigation of its then director, Gérard Neveu. 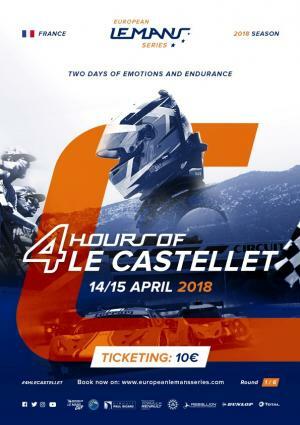 Since its creation in 2004, the Le Mans Series (followed by Le Mans Endurance and subsequently the European Le Mans Series) has begun each season at the Le Castellet track in the South of France by means of the annual international press gathering. In 2013 the ELMS season closed at Paul Ricard, while in 2014 it was the penultimate race won by the Swiss NewBlood by Morand Racing team. The fourth round of the 2015 ELMS was exciting from start to finish and after the chequered flag was waved. JOTA Sport crossed the line to finish first on the road only to see the win handed to Greaves Motorsport after a regulation infringement (driving time) by one of the JOTA Sport drivers. Le Castellet was also the place where the very first LMP3 title was won after Sir Chris Hoy and teammate Charlie Robertson won their third race of the year, securing the title with one race of the season remaining. Formula Racing (LMGTE) and TDS Racing (GTC) won their second race in their respective class.